Cycling is one of the best ways to discover the island. Between hills, off-road trails and scenic coastal paths, you can enjoy the view while simultaneously getting in a workout. The cycling season is divided in two, springtime between February and May and autumn between September and November. The mild temperatures during these months make cycling in Ibiza an attractive proposition. June, July and August are the hottest and the busiest months on the island so not an ideal time for training. If you decide to come at this time then cycling at dawn not only ensures you have less traffic on the road but keeps you cooler than you would be in the hot sun. The highest point of the island is Sa Talaria and it sits at 475 meters above sea level, so those looking for mountains trails should probably go elsewhere. The rolling roads and quiet lanes are quintessentially Mediterranean, lined with olive trees, orange and lemon trees. Luscious and green, the south of the island offers fast, smooth roads, with the north being a hillier affair with rougher, smaller roads and quiet views. For those looking to get off the beaten track and onto the rough stuff, Ibiza’s vast array of trails allows you to explore the island without the need to spend too much time on the road. Its dry climate means the trails and single track are often fast and dusty, ideal for a hardtail mountain bike. For those looking for a challenge, the short, steep climbs dotted around the island are sure to test even the strongest legs. Rocky, technical descents make for an exhilarating ride and breathtaking views aplenty; there is no better way to discover the White Isle. Want to know more? Check out our island guide to Outdoor activities in Ibiza. One of the things most people love when they are on holiday is to discover new places. So today we look at some places which, despite their beauty, have remained unspoiled and off-the-beaten-track. Probably the most famous “hidden gem” on the island. Surrounded by pine forests and some fisherman’s haunt, this beach feels like a true escape. Getting there is not for everybody and this keeps visitors number low. Before heading to the beach make sure to buy some food and drinks as there aren’t any amenities available nearby. This is the right place if you seek seclusion. Es Portitxol looks like a lagoon surrounded by unspoiled nature, the beach is almost circular and the water of a beautiful green and turquoise colour, perfect for snorkeling. Getting there involves some serious hiking so make sure to be prepared and bring all the essentials. Located on the North of the island near Port de Sant Miquel, Caló des Moltons is a quiet bay with flat rocks and pebbles, boathouses, and cool, still water. Easily accessible by foot on the side of San Miguel beach. While it has the feel of a private find, the inlet has its own chiringuito: Utopía – a pretty wooden beach bar and surprisingly upmarket place, with good cocktails and sardine specials. This unspoiled beauty and calm charm are further enhanced by our exceptional secluded villas on the islands. Choose yours and begin an Ibiza journey of discovery, far from the crowd. Partying and lounging on the beach might be enough for some people, but if you love adventure, we’ve got a few fun activities for you to look through while here on holiday in Ibiza. Experience the thrills & spills of Ibizan adventure tours! Who doesn’t love an off-road adventure? Discover the beautiful beaches and hidden spots of the island with a quad. If you don’t feel confident driving a quad bike by yourself and would prefer to go with another person, then a beach buggy is the ideal option for you – they are overall bigger than quad bikes and provide more protection around the outside. Don’t forget to take some pictures of this unforgettable experience, because let’s face it, we all look pretty cool on a quad, right?! Although it’s a relatively small island, Ibiza offers a wide variety of terrains and trails for mountain biking that will take you through some of the most beautiful countryside landscapes with breathtaking views over the Mediterranean. Not to mention that Ibiza’s well-stocked cycling shops and knowledgeable local guides are a bonus! An experience for those who like it rough and rugged is a jeep safari – it takes you off the beaten track to places that would do some serious damage to your hire car! During the tour, you will get to discover the island’s iconic landmarks as well as some beautiful hidden spots. Some tours also offer a range of 4×4 trips that last for several hours, with as much on or off-road as you like. The island’s coastline is dotted with many diving centres that will take you to Ibiza’s protected marine areas to discover its beautiful underwater worlds. Want to know the best scuba diving spots in Ibiza? Read our previous blog – Top 3 dive sites in Ibiza. If you want to book an adventure tour to make your holiday in Ibiza even more exciting, just let us know and we will arrange it for you. The beautiful Mediterranean sea with its turquoise waters has been attracting millions of tourists to Ibiza each year – after all sun, sea and sand are three cliché reasons why many people come on holiday here! This time, we will focus on the second point: the sea. Here we’ve rounded up our top 3 activities to discover the beauty of Ibiza offshore. Enjoy paddling around Ibiza’s stunning rocky coastline from one secluded bay to another. Revel in the hidden treasures you may find on a tour into secret caves, manoeuvre around the magnetic Es Vedra rock or watch the sun setting on the horizon. There are a number of adventure tours available for all levels and provided the water is as calm as normal, Ibiza is a safe place for family trips. We recommend Kayak Ibiza, the islands largest and most established Kayak company. Speak with Lauren or Paolo for a three hour tour, whether bespoke for your group or while joining a larger group, makes for a great excursion…and then laze on the beach on your return to sooth some tired arms! Diving is one of the most freeing and exciting adventures and when you are here, how could you resist diving into Ibiza’s crystal clear waters? It’s the perfect way to explore the rich and colourful underwater world. There are many organized tours around the island and the mild water temperatures make for truly optimal diving. Punta Dive is the island’s largest dive company and has three dive centre locations on the island with top-notch facilities and equipment are on offer. Alternatively, Big Blue Ibiza is a small dive centre in the south west of the island right on the beach at Cala Vadella from where you can visit local dive sites. Get ready to experience Ibiza’s stunning underwater realm. A day charter in Ibiza’s beautiful turquoise waters is a day to remember. You can get away from the crowd and see the island from a truly inspiring new perspective in total luxury. We can offer the perfect each adventure on board of our beautiful yacht – Aurora is based on the island’s west coast, by far the prettiest to explore and calmest to navigate, with an abundance of sandy beaches and hidden coves that you can only experience by boat. Visit some of the finest beach restaurants or have a delicious picnic on-board, the choice is yours. Is just one charter enough? You will ask yourself when isn’t there a good time to go to Ibiza? Even if the White Isle is known mainly for it’s beautiful beaches and the parties of the summer, late summer and autumn are still very good seasons to enjoy the island – especially if you love the outdoor life. While nights can get a bit cooler, during the day there’s often summer-like weather with mild temperatures. It’s cool enough for exploring the enchanting countryside and there’s no problem getting around as the island is less packed – the ideal conditions to practice sports and outdoor activities. As the heat of summer wanes it is the perfect time to start enjoying one of the great cool-weather pleasures of Ibiza: walking and hiking the many beautiful corners of the island. Despite being a small island, Ibiza has an abundance of quaint valleys and unspoiled hills to explore. There are companies on the island that offer tours. 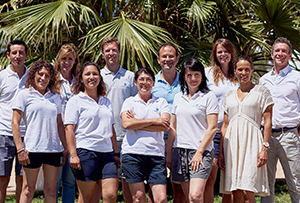 We recommend Toby of Walking Ibiza – you can book either a private or a community tour. If you don’t feel like a tour and want to go exploring by yourself, we encourage you to ask us and do a bit of research first, even if most of the trails are well-marked, it’s always better to have a map with you and to know where the route is heading. There are no truly big climbs in Ibiza which makes cycling enjoyable even for amateurs. The stunning countryside and green hills will be the perfect backdrop for a great day. We recommend Velo Club Ibiza if you want to hire a bike or take a guided tour. Their tours include road riding, cross country mountain bike rides as well as riding off the map across dusty caminos and gravel tracks – known only by locals! Ibiza’s forest trails make it an ideal place for horse-riding. We recommend you Can Mayans, on the road from Santa Gertrudis to San Lorenzo, their tours will take you on nature trails during the day and romantic full moon rides at night under the stars.